It’s been a while since we had the pleasure of talking about a fantastic Kickstarter, but wait no longer! Dungeon Dressing Dice is Hexes & Bows’ latest review and boy was it fun to demo! Gnome plays single player on this episode and shares his thoughts and experience with Incognito Solutions Inc.’s tabletop accessory: Dungeon Dressing Dice. Now, let’s first just start off with the fact that dice are fun to collect, so if you’re just looking to add a unique set of dice to your already multiplying collection, this one’s a bit of a no-brainer to invest in! However, if you want something that is not only durable, functional, AND fun, definitely look into picking up a set of Dungeon Dressing Dice. This product, according to Gnome, is perfect for Dungeon Masters that struggle with filling their dungeon rooms with interesting, story-based items. 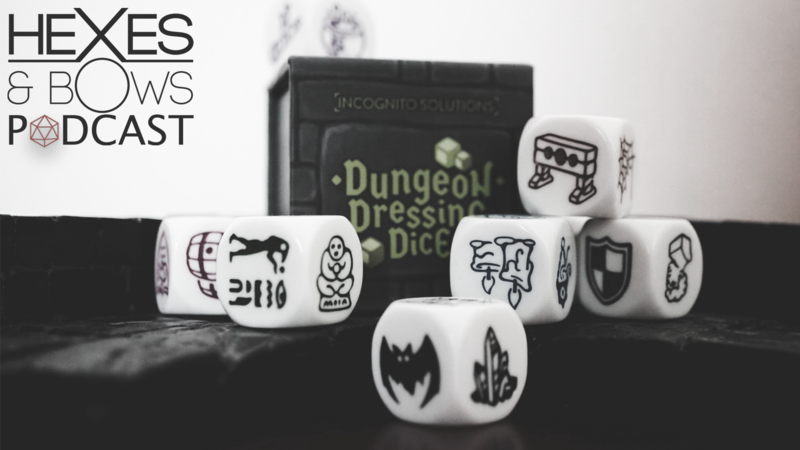 Whether you’re trying to create an elaborate manor many sessions in advance or forced to create a new dungeon room on the spot, Dungeon Dressing Dice is there to help. Take a few minutes and listen to Gnome’s detailed and honest review! Dungeon Dressing Dice has 12 days left on Kickstarter and already reached it’s funding goal of $6,500 for mass production, sitting at $16,000 as of posting this review! Check out the Kickstarter here and follow Incognito Solutions on twitter! Gnome also takes a moment to make an announcement regarding Hexes & Bows new project: Hexes & Bows Actual Play Podcast! The characters are cast and the stage is set! H&B will be playing a homebrew D&D 5e game with a great cast of characters and a brand new world! Thank you so much for listening! Don’t forget to subscribe on iTunes, Podbean, or other podcast apps so you don’t miss out on an episode! Talk nerdy with us on social media! And visit http://hexesandbows.com for updates, cast lists, videos, past podcasts, and more! Disclaimer: Dungeon Dice Dressing sent us this product for free to demo and review. Our thoughts and views on any product sent to Hexes & Bows for reviews are explicitly our own and are not influenced by the company or any of its affiliates. This weekend, I attended ComiCONN at the Foxwoods Resort Casino in Connecticut. I was actually there on behalf of another body, Exploring Comics, but while there I ran across a small local tabletop game developer called Angry Duck Games and we had a great chat. They were providing a promo of their new game, which stands out to me in a number of ways. Student Bodies is a board game in which players must make their way through a zombie-infested high school. However, unlike many other zombie infestation stories, the players are neither equipped to handle the crisis nor are they trying to avoid infection. Each player, in fact, begins play as a high school student that’s already bitten, but not yet turned. Using the limited skills and knowledge available to the average (and I do mean average) high school student, you must fight through the hordes of undead and beat the other players to a promised single dose of antidote at the other end of the school, find out which chemical in the lab is actually the right one, and then escape the building with your prize before the military destroys the school and everything left inside. Obviously, this is a highly competitive game. Lots of zombies, one antidote, and only so much time. There’s a lot of teen angst and drama available here! Not a competitive gamer? Rejoice in knowing that there’s also a cooperative aspect! All you have to do to change the feel of the game is die! When your character dies, instead of sitting out the rest of the game, you begin playing a zombie. And all the zombies are one big happy team with a shared objective: stop and, if possible, eat the other players. While talking to Tim Lee, product manager and publisher with Angry Duck, I also had the opportunity to watch some of the game in action, and it looks really fun. They estimate the game taking about 45 minutes, and while I don’t actually know the top end of how many players can participate, they had four actively involved. It will be a great addition to any game night that has room in its cold, dead heart for horror survival and youthful violence. They have a lot of other projects in the works, and we have opened discussion about having access to those as soon as they become available for review, so keep an eye out here for more from Angry Duck Games! Student Bodies is available from the ADG store for $40 and is recommended for ages 14 and up. Look. I know as a writer I’m supposed to be professional and carry a professional voice when doing publications…. The Nerdist just reported that TOEI and Dyskami Publishing are releasing several tabletop games between now and 2018! I am totally freaking out! Sailor Moon, a beloved, cherished part of my 90s upbringing is launching a series of board games?! 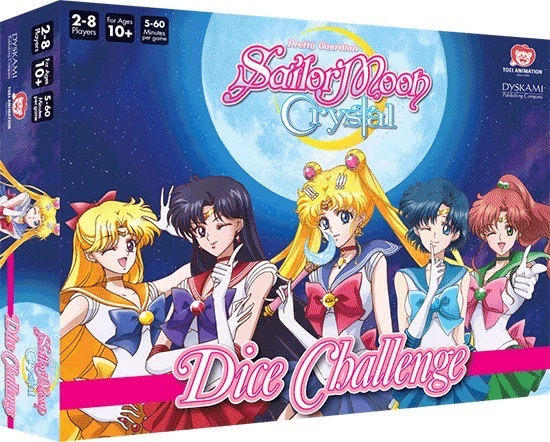 The first game to be released is similar to a game called Butten Men by Cheapass Games who will be reinventing the game for the new Sailor Moon Crystal Dice Challenge! This game is set for release at the end of summer in 2017. I’ve admittedly no idea what Butten Men is, but when you’re a tabletop gamer like me and hear the word “dice,” it’s an insta-buy! 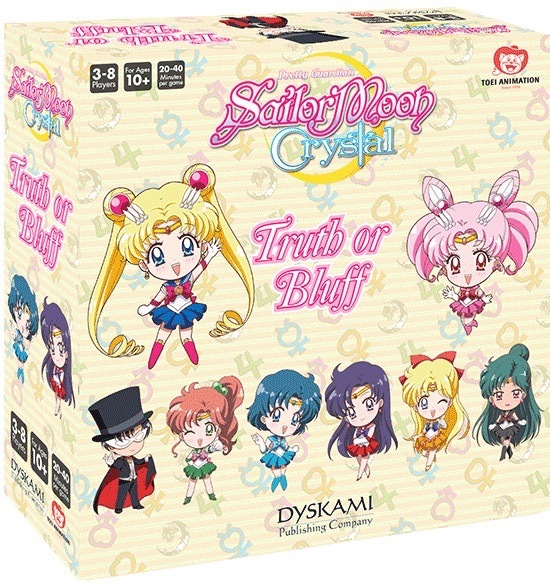 Shortly after, fans of Sailor Moon Crystal can snag a copy of Sailor Moon Crystal Truth or Bluff! You’ll have to rely on your wits like Ami or manipulation skills like Haruka to win. Look for this title to hit shelves sometime in Fall, 2017! This is only the first two in a series of games that TOEI and Dyskami Publishing are releasing. I’ll be keeping a super close eye on any additional information being released and share with you all! Maybe we’ll get a D20 Sailor Moon roleplaying game? Or, perhaps a storytelling co-op like Mice and Mystics! Let us know in the comments whether or not your geeking out as hard as we are over here about Sailor Moon games!